You’ve tried your best giving your loved one the attention and care they need, but either it’s become overwhelming or they need more assistance than you can or know how to offer. So where do you turn? Home health care is one of the leading solutions for families who have loved ones still living alone, but now need some assistance in everyday tasks. Being a caregiver is hard – no doubt about it. When mom or dad spent decades being self-sufficient and independent, being forced to rely on others is a difficult transition for all involved. As a caregiver, you have your own life – work, school and everything you do in between. Instead of developing frustration or stress in the latter years of your elder’s life, turn to home health care as a way to give them the care they need. What are the qualifications? You want to make sure the home health care agency is fully licensed by the state and even ask to see a review if you’re inclined. Ask about employee screening and request some references, list of doctors or other professionals who have worked with the agency. It’s important to know that your loved one is being taken care of professionally and properly according to laws and federal requirements – so be sure that the home health care agency is well equipped with the proper staff. What Home Health Care Services are Offered? 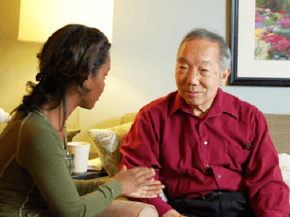 Depending where you look, home health care agencies can provide a range of services including meal preparation, live-in home care, light housekeeping, transportation and private duty nursing. In many situations, loved ones need specific care or just want companionship – these services can be done hourly or more depending on a given situation. While it could take time to build trust between your family and the home health care agency, be sure to speak to the agency promptly should you have any questions or concerns. Another thing to consider is cost. The cost of health care can be expensive, so be sure to understand what is covered and what is not. In the event that your home health aide is on vacation or out sick, you should know what the protocol is before the time comes.